Khabib Nurmagomedov has threatened to quit UFC if his sparring partner Zubaira Tukhugov is fired by the organisation for punching Conor McGregor at UFC 229. Tukhugov, who appeared to punch McGregor from behind, was one of three men who exchanged punches with the Irishman in the melee that broke out following the main event. 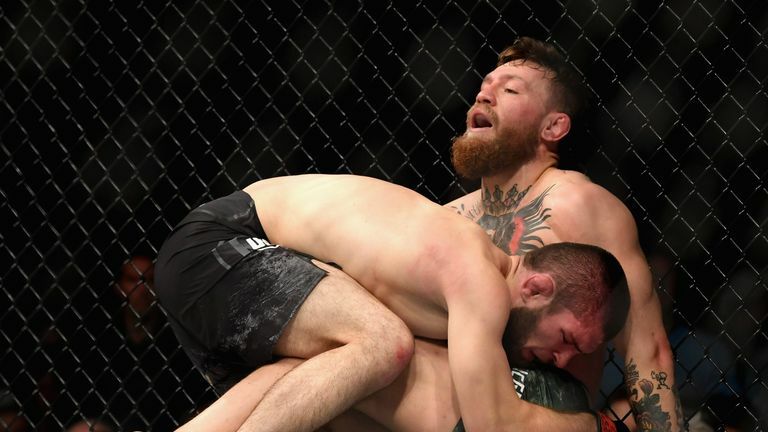 After Nurmagomedov submitted McGregor via choke in the fourth round of their lightweight title bout, he jumped out of the octagon to scuffle with Dillon Danis, the Irishman's jiu-jitsu coach. McGregor attempted to scale the fence as well but was restrained by security. He then exchanged punches with three men, two of whom jumped into the octagon to get at him. Nurmagomedov has now made it clear he is not willing to accept any of his camp being punished for their roles in the fracas. Nurmagomedov wrote on Instagram: "I would like to address the UFC. "Why do you have to punish my team, when both teams fought? If you say that I started it, then I do not agree, I finished what he had started. "If you think that I'll keep silent then you are mistaken. You cancelled Zubaira's fight and you want to dismiss him just because he hit Conor. But don't forget that it was Conor who had hit my another Brother FIRST, just check the video. The Nevada State Athletic Commission has withheld Nurmagomedov's purse from the fight pending the outcome of an investigation. UFC president Dana White said earlier this week he believes a four-to-six month suspension and a $250,000 fine would be appropriate punishments for Nurmagomedov, but added the UFC has no plans to strip him of his lightweight title. Regardless of what happens, Nurmagomedov does not regret his actions after the biggest win of his career. Nurmagomedov added: "And one more thing, you can keep my money that you are withholding. You are pretty busy with that, I hope it won't get stuck in your throat. "We have defended our honour and this is the most important thing. We intend to go to the end. #Brothers"
Las Vegas police confirmed no arrests were made because no one involved wished to press charges but White promised punishments for those who tangled with McGregor. White said: "The guys who jumped in will never fight here." "The guys who jumped in will never fight here." Tukhugov is scheduled to fight McGregor's team-mate Artem Lobov on October 27 at a UFC Fight Night in Moncton, New Brunswick. As of Thursday afternoon, that fight remains on the official schedule on UFC.com but Nurmagomedov believes it has been cancelled and is far from happy about it.